Measure accurately to make a comforter and dust ruffle that fits the bed perfectly. 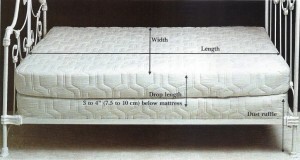 Comforters reach 3″ to 4″ (7.5 to 10 cm) below the mattress line. 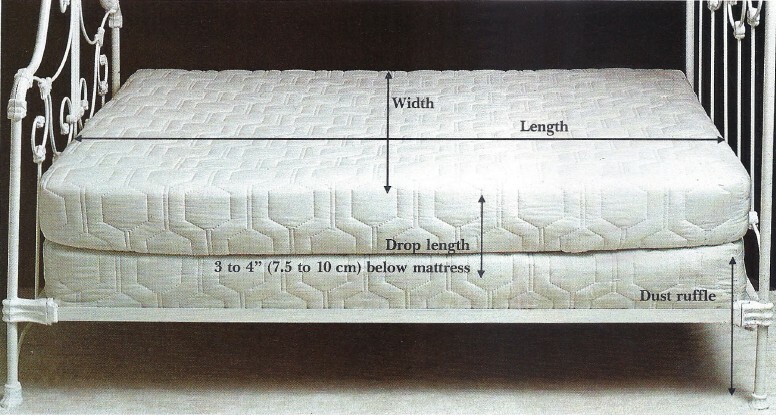 They have a drop length (the distance from the upper edge of the mattress to the bottomofthe comforter) of 9″ to 12″ (23 to 30.5 em), depending on the depth of the mattress. Determine the drop length by measuring from the top of the mattress to the top of the box spring, then adding to that figure the amount of overlap desired. Take into account fabric stiffness which may cause the comforter to stand away from the side of the bed. To determine finished comforter size, measure from side to side across the top of the mattress for width, and from the head to the foot of the bed for length. Add the desired drop length to the length of the bed, and twice the drop length to the width of the bed for finished measurements. Batting for comforters is available in standard widths for. beds of standard sizes; select the proper size for your comforter. For the finished dust ruffle length, measure from the top of the box spring to the floor; for the deck, measure the width and length of the box spring. Pillow sizes are 20″ x 26″ (51 x 66 cm) standard; 20″ x 30″ (51 x 76 em) queen; and 20″ x 40″ (51 x 102 em) king. Pillow puffiness varies, however, so make the best-fitting shams by measuring the width and length of the pillow with a tape measure across the center of the pillow. Ruffled shams made from lightweight fabrics will droop around the edges if they are cut too large.